Caribbean Pools pool construction process. We take the time to understand exactly what our client wants! We are more than just a custom swimming pool builder, we design your dreams. First we come out to your house and meet with you to explain the pool construction process. We take detailed notes and sketches of your pool area. We then go back to our showroom and create a computer rendering model of your backyard. We actually transform the flat 2D design into a fully interactive 3D swimming pool presentation. We don’t simply show your professional design; we immerse you, the homeowner, in your new swimming pool construction and backyard. From the sun shining through the rush of the waterfall to the sparkle of moonlight across the pool, you will experience it all. To talk to a custom swimming pool builder from Caribbean Pools just give us a call. Caribbean Pool’s computerized design system allows us to create fully interactive 3D presentations of your backyard swimming pool and spa construction. 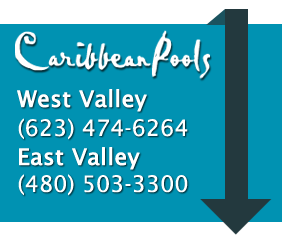 Click Here for Arizona Swimming Pool Construction Specials and don’t forget to Like Caribbean Pools AZ on Facebook to view recent projects and keep up with our latest news! Give us a call or contact us today to get started!